In arguing against the death penalty, I must represent our Jewish teachings honestly. The Torah does not categorically oppose capital punishment. After the flood, God instructs the children of Noah, “He who sheds the blood of man, by man shall his blood be shed.” Human beings must build societies governed by fairly-enforced laws. This includes legal execution for the most heinous crimes. At the same time, Jewish tradition has been so concerned with fairness and equity in administering the death penalty, that it developed extremely stringent standards. For a guilty verdict, two valid witnesses must first warn a person that he is liable to be executed if he carries out the act. He must next verbally acknowledge his understanding and then carry out the crime regardless! With these requirements, it is nearly impossible to get a capital conviction. To exercise the death penalty, we Californians have an obligation to ensure that it is done with justice and equity: without discriminating based on the location of the crime, the skin color of the victim, or the income of the accused. Unless we can rise to this responsibility, it is a punishment method that we should forego. We have had decades to figure this out in California, without success. The time has come to acknowledge the eternal imperfection of human justice. The best way to pursue righteousness and equity is by banning the death penalty. 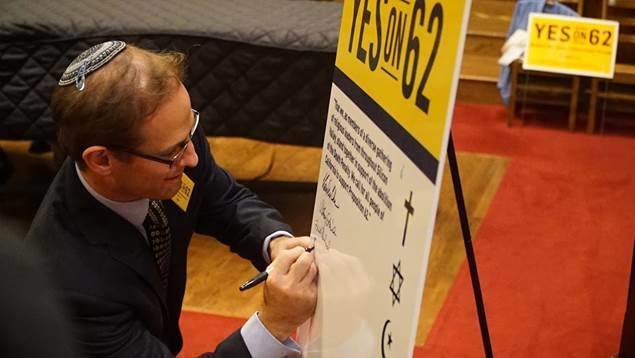 On behalf of the Cantors and Rabbis of Greater San Jose, I urge us to approve Proposition 62 and reject Proposition 66. May we have the wisdom to always see the Divine in each other. Amen.